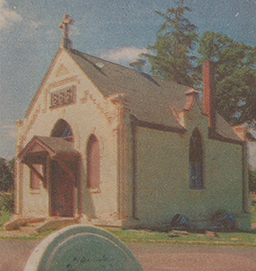 The old 1885 Elmhurst Gothic Revival Chapel once stood where the Columbarium Niche Garden is currently. 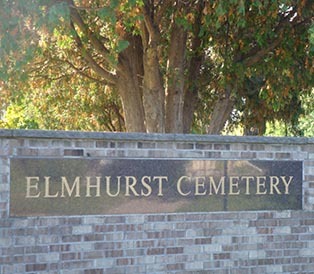 The centerpiece of Elmhurst Cemetery, St. Paul's third oldest cemetery, the one-room structure was imposing, almost baronial from a distance with it’s delicate Gothic tracery framing the pointed-arched windows and brick gingerbread on it's front gable ends. Surrounded by the 760 elms that graced the narrow lanes throughout the cemetery, the Chapel was the size of a one-room schoolhouse and constructed of stout brick pilasters at the corners and lead-glass windows. 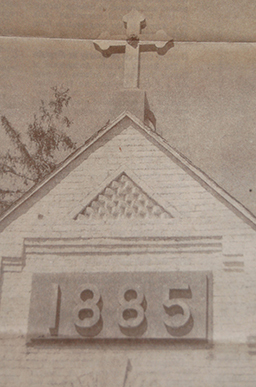 The keystone plaque over the main double door entry read 1885. In a by-gone era the Chapel was where those who died during winter were lowered through a trap door in the floor and stored in the air-cooled cellar until the ground thawed out in spring. It could hold 25-30 coffins in the old crypt area. Never heated and no plumbing, the building turned from chapel to storage as modern technology for grave digging made winter burial possible. In 1997 it was decided by Trinity and St. John's Evangelic Lutheran churches in St. Paul, which owned the cemetery, that the cost of restoration of the historic landmark was just too costly and was demolished in 1998. The old 1885 Gothic Revival Chapel gone today but not forgotten in the passage of time.